Today, oversized watches have become quite common; however this was not always the case. From the time the wristwatch first became popularized, somewhere around the 1920s, its dimensions have been steadily increasing. Very slowly at first, with the earliest models for men starting at the 30mm-32mm mark, then sprouting over the years to a maximum of 36mm for the more formal pieces (40mm for tool watches), and sticking at that for most of the second half of the 20th century. However, around the turn of the millennium things began to change, and luxury watch manufacturers started upping the scale of their watches dramatically. By the mid-2000s, it was not unusual to see bold, in-your-face designs topping the scales at 45mm and beyond, dragging the average size ever higher with them. Today, the accepted median has risen to 40mm-42mm, but the race to create the biggest dinner plate-sized wrist adornment seems to be over, with many brands releasing pared down offerings of some of their most popular models in the last few years. But while the trend may have come full circle, there is still an audience for oversized watches. The right one, on the right person, can look imposing without being too overpowering; however they all, certainly, make a statement. Below, we will take a look at three of our favorite oversized watches. 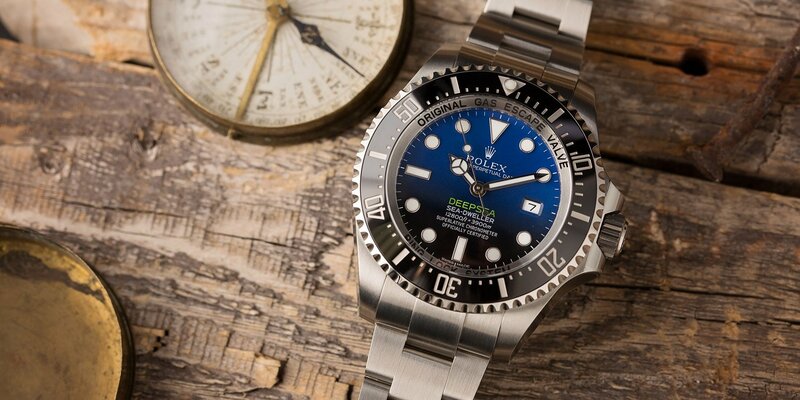 Although it can hardly be considered “oversized” by today’s standards, the 44mm Deepsea is the largest watch in Rolex’s catalog. As one of the leading manufacturers of oversized watches, Breitling occupies an obvious spot on our list (Image: Breitling). It’s no real surprise to find a Breitling head up a list of oversized watches. Beloved by both military pilots and Special Forces, the Swiss manufacturer rarely releases anything shy and retiring out of their Grenchen-based fortress. The Avenger Hurricane 12H was released in 2017, a follow-up to the even more soldierly-inspired Hurricane from the year before, which featured a 24-hour numeral display. The 12H is a little more conventional and civilian friendly, meaning an hour hand pointing at the three o’clock indicates that it actually is, in fact, three o’clock and not 06:00. 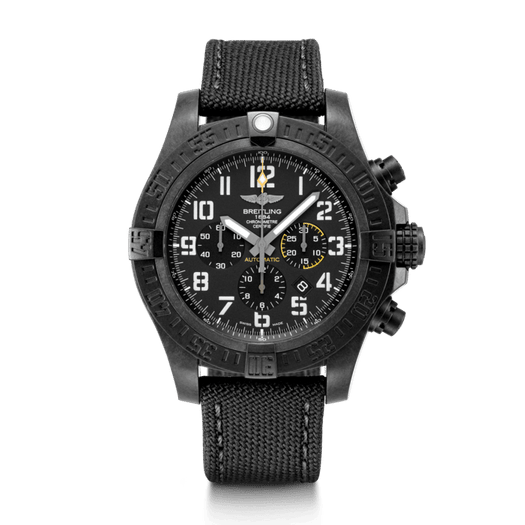 One thing that the Breitling Avenger Hurricane 12H isn’t, however, is small. There are two sizes available: a positively minuscule 45mm version, and a just about manly enough 50mm variant. Both are made from Breitling’s own patented material, Breitlight – a high-tech polymer reputedly six times lighter than steel and more than three times lighter than titanium, while being considerably harder than both. The use of Breitlight makes the amply proportioned piece surprisingly wearable, although this is certainly not one for every workplace. Sitting at the thick end of the spectrum at 17mm in height, it won’t be slipping discreetly under any shirtsleeves either. The dial, in either Volcano Black or a bright Cobra Yellow is extremely legible – as you would hope, considering the amount of real estate at hand. The trio of sub-dials sit in acres of space, with the 30-minute register given a touch of colored accenting to help with readability. The tip of the chronograph seconds hand is similarly colored; orange on the black version, and red on the yellow one. Additionally, a small date display window sits at the 4:30 position. 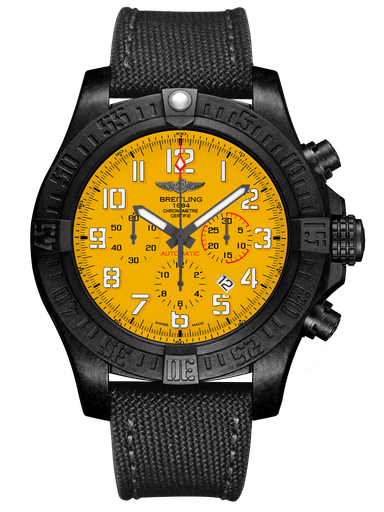 Despite falling objectively into the category of “oversized watches” the Breitling Avenger Hurricane 12H is relatively lightweight due to its Breitlight construction (Image: Breitling). Encircling it all is a familiar-looking Breitling unidirectional bezel, with its four rider tabs at the 15-minute markers. The dial is covered with a sapphire crystal treated on both sides with an anti-reflective coating to provide it with excellent legibility at any angle. Inside is where the biggest difference lies between this one and the original version. Swapping the older watch’s Caliber B12 for the wonderful in-house B01 gives the Hurricane 12H a column-wheel chronograph movement with a vertical clutch, which eliminates any sign of judder on the central seconds hand whether starting, stopping, or resetting. It also has Breitling’s own self-centering system and a shock-absorbing escape wheel to make the whole watch more resistant to impacts. To top things off, the 28,800vph, 47-jewel movement also offers a 70-hour power reserve. In case you were in any doubt, this is a watch aimed at the testosterone-dripping action man. It even comes with an exclusive military textile fiber strap, with a rubber inner lining. Additionally, the chronograph pushers and crown are covered with a non-slip material so they can be easily operated while wearing gloves. Overall though, especially for a watch measuring 50mm, the Hurricane 12H is not especially blatant. The stealth-like case material helps it remain relatively incognito and the black dial version in particular does a good job of staying covert – a perfect choice for all Navy Seals and office-based, Seal-wannabes. At 49.2mm in diameter, the Railmaster XXL is one of the largest watches ever manufactured by Omega (Image: Omega). Omega’s Railmaster formed one-third of the brand’s revered ‘Master’ trilogy when it was first released in 1957. It was the watch built for scientists, in the same vein as the Rolex Milgauss or the IWC Ingenieur, and debuted alongside the now legendary Seamaster and Speedmaster. Yet despite its inbuilt Faraday cage, designed to protect the watch’s caliber from the damaging effects of electromagnetic forces, it always languished behind its companions in both image and sales. While the Speedy and the Seamaster went on to become icons, the Railmaster was often the forgotten Omega. In fact, it was so poorly received that it was discontinued in 1963 and wasn’t seen again for 40 years. When the Railmaster made its comeback in 2003, it was at a time when Omega was setting about reinventing itself. At the heart of the brand’s turnaround were its groundbreaking Co-Axial escapements, seen as perhaps the most important development in mechanical watchmaking of the 20th century. The naturally paramagnetic components in its caliber took the Railmaster from its original 1,000 gauss protection to an incredible 15,000 gauss, doing away with the need for the soft iron cage altogether, while simultaneously shielding the movement from the kind of mammoth fields generated by an MRI machine. The refreshed series was initially launched in three sizes; 36mm, 39mm, and 42mm, but just a couple of years later, the XXL emerged. This, to everyone’s surprise and not a little confusion, measured in at an enormous 49.2mm. 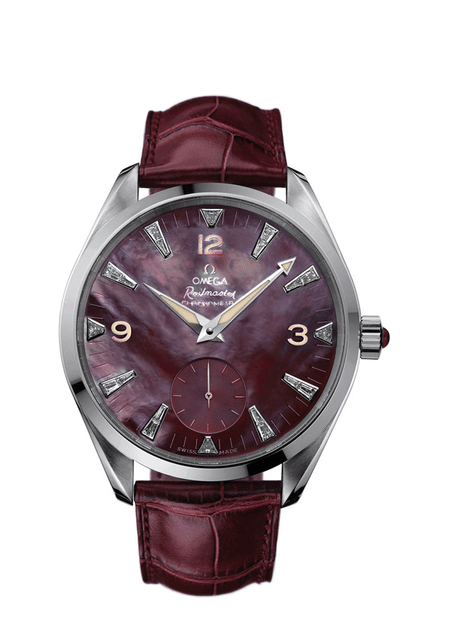 Omega even fitted a mother of pearl dial with diamond hour markers to their Railmaster XXL (Image: Omega). Styling-wise, it took its cues from the entry-level Aqua Terra collection, a simple, rounded case with a slight twist to the lugs. Visually appealing and remarkably easy to read, the time-only piece retained the same type of handset as the first of the 1950s models, except the minute hand received the arrowhead rather than the hour hand. A separate sub-dial at the six o’clock counted off the seconds. Inside was a manually-wound Caliber 2201 movement, just to add to the unorthodox nature of the thing. With that in mind, a 17-jewel pocket watch movement with a 53-hour reserve was probably the only mechanism that Omega could find big enough to fill the Railmaster XXL’s massive case. As an attention-grabber packed with the latest technology, and coming along when it did – when the trend for huge watches was reaching its peak, the XXL was all set to reverse the Railmaster’s ailing reputation. Except, not so much. 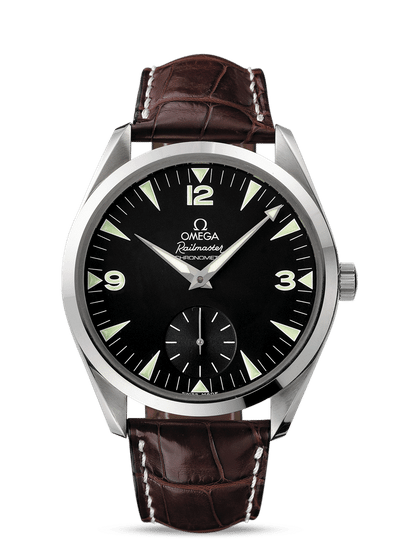 With Omega also updating the rest of their range, the scientist’s watch found itself in the familiar position of the underachiever, and it was retired from the lineup once again in 2011. Although the Railmaster has since risen from the ashes a second time, coming back in 2017 as part of the Seamaster collection (giving us the awfully titled, Seamaster Railmaster line) the XXL didn’t make the cut. These days, the range tops out at 40mm, keeping more in-line with modern tastes. However, as a niche example of an already niche watch, it remains an interesting and especially handsome oddity, and one of the most notable oversized watches from Omega’s history. 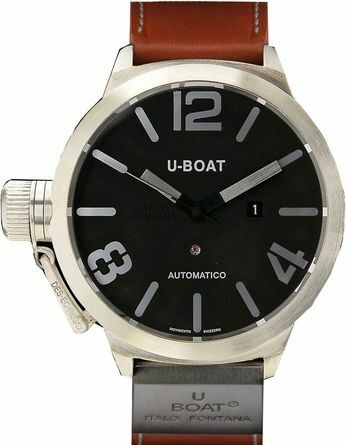 Nearly all U-Boat watches rank among the largest oversized watches currently available (Image: U-Boat). Getting Sylvester Stallone to commit horological adultery on his trademark Panerai favorites takes something very special, but the ginormous offerings from fellow Italian brand, U-Boat seem to have been turning his head in recent years. The fact the two bands share a number of similarities is probably just a happy coincidence. Both were originally commissioned by the Italian Navy during WWII, who was in need of watches tough and reliable enough for front line action. Unlike Panerai however, whose first attempt (the Radiomir) went on to become an all-time classic, the designs put forward by U-Boat’s founder Ilvo Fontana were never to see the light of day. Flash forward sixty-odd years to 2000, and Ilvo’s grandson, Italo stumbles across grampa’s doodles and busies himself turning them into a range of models unlike pretty much anything else out there. The Classico collection marked the brand’s transition to the high-end market, and a move away from their earliest pieces, which were powered by Japanese manufactured, Miyota quartz movements. For the Classico, and the Thousands of Feet and Flightdeck collections that quickly followed, U-Boat brought in Swiss-made ETA calibers to their Tuscany-based operation. Additionally, Italo and his team of master craftsmen started experimenting with new materials, such as carbon fiber, tungsten, and bronze, alongside the steel, gold, and silver of their original models. 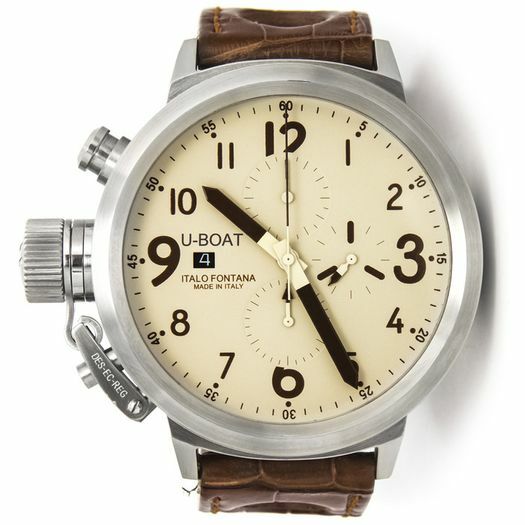 U-Boat has more-or-less made oversized watches one of the signature traits of their collection (Image: U-Boat). Although the largest model in the modern-day Classico line is a measly 50mm, a behemoth 53mm piece was available just a couple of short years ago, and was an utter bruiser of a watch with a height of around 18mm. Rather than just relying on its dimensions to make the headlines, the series was actually made up of finely crafted, intelligently laid out and unconventional pieces, designed to stand out from the scored of humdrum and run-of-the-mill watches. Consisting of both three-hand and chronograph models, the Classico A925 is the former – and you will search for quite a long time before you find a more legible watch. Available with either a black or beautiful cream sandwich dial, the hour indexes are enormous, with long stick batons between the three full numerals – which, unusually, are placed at the 12, 4, and 8 locations. The hands are no-nonsense squared sticks, and it has an almost comically small date aperture hiding somewhere around the three o’clock position. A display caseback lets you see the mechanical movement purring away inside, which is essentially installed upside down to facilitate a U-Boat signature design trait: the left-handed crown. That crown positioning is vital to the watch, making it a much more comfortable wear, especially on the chronograph models that have giant winding crowns and similarly colossal pushers. Additionally, the protective crown guard owes more than a little debt of gratitude to a certain Luminor. There’s no denying that U-Boat’s watches are an acquired taste and certainly not for everyone. In fact, unless you have arms like Rambo, it is probably best not to even attempt the 53mm version. But there is no faulting the build quality across their entire output, and their hyper-masculine aesthetic is definitely an attention-getter. Andy Callan is a freelance luxury watch writer based in Northern Ireland, UK. His passion for the aesthetics of high-end mechanical watches, and the beauty of a hand-finished movement, has given him a lifelong obsession with all things horological. Besides writing extensively for Bob’s Watches, Andy’s work can also be found in several other online publications.